Jesus tells us to “seek first the kingdom of God” (Matthew 6:33) and promises blessings if we do. Why should we seek first the Kingdom of God? How should we do it, and how will seeking God’s Kingdom change our lives in the process? What does it mean to “seek first” the Kingdom of God? How can this change your daily life? 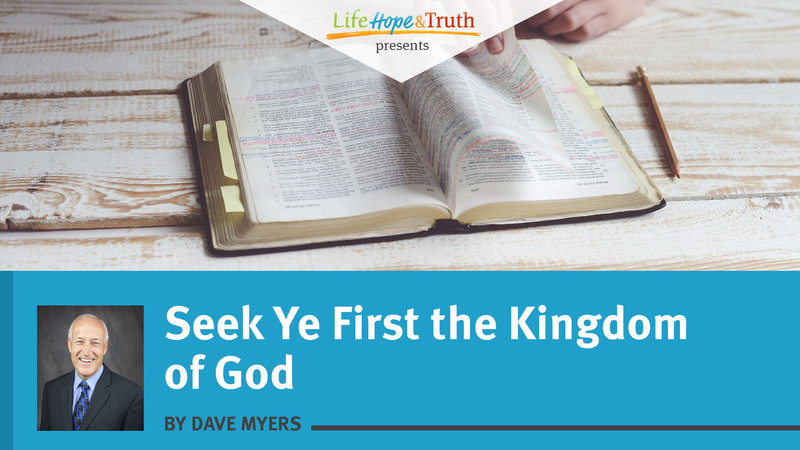 Watch this short video by Foundation Institute instructor Dave Myers to learn some practical ways you can “seek first” the Kingdom of God in your life starting today. As part of His famous Sermon on the Mount—one of the most extensive documentations of His preaching—Jesus addressed the common questions each of us faces in order to survive (Matthew 6:25-34). How am I going to meet my needs? Will I have food and drink? Will I have clothing? The simple, yet profound, reason we must seek God’s Kingdom is that thousands of years of history show that we humans cannot effectively rule ourselves; and in the end, all human governments apart from God will fail. Solomon wrote in Proverbs 14:12 that “there is a way that seems right to a man, but its end is the way of death” (emphasis added throughout). Jeremiah added: “O LORD, I know the way of man is not in himself; it is not in man who walks to direct his own steps” (Jeremiah 10:23). Humans have tried every form of government, yet all have eventually come to an end. In addressing events leading to the end of man’s age of self-rule and the beginning of God’s rule on this earth, Jesus said, “For then there will be great tribulation, such as has not been since the beginning of the world until this time, no, nor ever shall be.” Continuing, He said, “And unless those days were shortened, no flesh would be saved” (Matthew 24:21-22). In short, humans need a better government, a government that will be able to produce peace and prosperity forever. The Bible promises that there will indeed be a better government coming to this earth to replace all human governments. The Bible promises that there will indeed be a better government coming to this earth to replace all human governments. After explaining that there would be three more world-ruling empires following the one headed by King Nebuchadnezzar, Daniel the prophet wrote: “And in the days of these kings the God of heaven will set up a kingdom which shall never be destroyed; and the kingdom shall not be left to other people; it shall break in pieces and consume all these kingdoms, and it shall stand forever” (Daniel 2:44). Jesus’ teaching included instruction on how to seek God’s Kingdom: “The time is fulfilled, and the kingdom of God is at hand. Repent, and believe in the gospel” (Mark 1:15). Repentance and belief are the two foundational stepping stones by which entrance into this glorious Kingdom will be permitted. To repent means we must change our normal way of thinking, which is against God. The Bible reveals that “the carnal [natural, human] mind is enmity [hostile] against God; for it is not subject to the law of God, nor indeed can be” (Romans 8:7). We thus need a change in thinking that will then lead to turning away from sin and keeping God’s commandments. As Jesus said, If you want to enter into life, keep the commandments (Matthew 19:17). When we repent of our sins and begin keeping God’s commandments, the next step is baptism. Speaking to people who had been convicted of their sins and who wanted to know what they should do, Peter said, “Repent, and let every one of you be baptized in the name of Jesus Christ for the remission of sins; and you shall receive the gift of the Holy Spirit” (Acts 2:38). Baptism—immersion under water as a symbol of the washing away of our sins and the end of our sinful lifestyle—is a covenant we make with God and Christ. It represents our understanding that we have broken God’s law and need to be forgiven of our sins. It also signifies our commitment to obey God’s law. We are now convicted of our need to live by every word that comes from God and Christ. As Jesus noted, “Man shall not live by bread alone, but by every word that proceeds from the mouth of God” (Matthew 4:4). The next step in baptism is the laying on of hands for the receiving of the Holy Spirit (Acts 19:6). The gift of the Holy Spirit is what makes one an actual child of God. “For as many as are led by the Spirit of God, these are sons of God” (Romans 8:14). As children of God, we are then to grow in “the grace and knowledge of our Lord and Savior Jesus Christ” (2 Peter 3:18). John referred to this as an ongoing purification process (1 John 3:3). The Kingdom of God is currently centered in heaven, so the Bible also calls it the Kingdom of Heaven. (Read more about this in our article “The Kingdom of Heaven.”) It is a real government that God says He is going to establish on this earth—but it’s not here yet. We have no guarantee about exactly when it will actually arrive. In fact, Jesus explained that none of us can be sure about when He will return to establish His Father’s Kingdom: “Of that day and hour no one knows, not even the angels of heaven, but My Father only” (Matthew 24:36). But He wants us to pray urgently for it to come (Matthew 6:10). What if that takes a while? It’s already been almost 2,000 years since Jesus spoke those words. What if we live out our entire lives and die before He returns with the Kingdom He promised to bring? The good news is that seeking first the Kingdom of God means more than just waiting on Christ’s return. When the coming Kingdom becomes our focus—when we make the decision to live by every word of God—that changes who we are. No, the Kingdom of God isn’t here yet, but the focus of Christianity is learning to live as if it already were. If we want to be part of the Kingdom of God, that desire should affect the things we say and the things we do in this life. Every day we’re alive between now and the arrival of the Kingdom gives us the opportunity—and the challenge—to make sure we’re living up to the standards God has set for us. In seeking first the Kingdom of God and His righteousness, we also learn to look at the difficulties of this life in a different light. When the congregation in Rome was arguing about whether Christians should eat meat that might have been previously offered to idols, the apostle Paul had to remind them to step back and look at the bigger picture. He wrote, “The kingdom of God is not eating and drinking, but righteousness and peace and joy in the Holy Spirit” (Romans 14:17). As Christians, we can take comfort that the trials and difficult decisions of this life are only part of a much, much bigger picture—a picture that involves a Kingdom that will stand forever. Of course, eating and drinking are still important aspects of our day-to-day lives, especially when we’re not sure where our next meal is coming from. “Therefore do not worry, saying, ‘What shall we eat?’ or ‘What shall we drink?’ or ‘What shall we wear?’ … For your heavenly Father knows that you need all these things. But seek first the kingdom of God and His righteousness, and all these things shall be added to you” (Matthew 6:31-33). When we make our primary focus seeking first the Kingdom of God and His righteousness (repenting of our sins and making a daily effort to live God’s way of life instead of following our own human nature), God promises to provide for our needs. He doesn’t promise to make us unimaginably wealthy. He doesn’t promise that we’ll eat only the finest and most delicious foods. He promises that He knows our needs and that He will take care of them. If we keep His Kingdom at the front of our mind (instead of third or fourth on our to-do list, or just something we’ll get to when we have the time), He’ll bless our efforts to provide for our families and provide us with our daily needs (Matthew 6:11). God created man in His image with lesser powers and abilities to prepare man to rule with Him in a government that will last forever. God’s purpose for telling us “seek first the kingdom of God and His righteousness” is to help us develop, through our experiences in this life, His holy and righteous character and prepare us to rule under Christ as kings and priests on this earth (Revelation 5:10). These are the beginning steps toward seeking the Kingdom of God, which will ultimately result in eternal life in the family of God. “The Kingdom of God Is Within You”—What Did Christ Mean?